I reign upon this throne. There comes a time in every toddler’s life when it is time to say goodbye to diapers or pull-ups, and embrace going to the bathroom like a big kid. 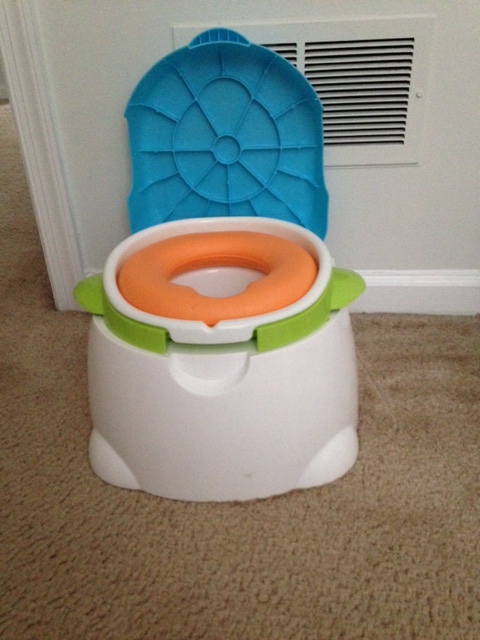 We’ve been working on potty training with Sophia, on and off, for the better part of a year. It’s been frustrating at times. But, hey, kids want to do things on their own time. We let Sophia start wearing underwear in place of a pull-up to see how she would handle it. Let’s just say that our house should have been surrounded with flashing lights–it was an accident zone. So, we’d stop for a while, go back to pull-ups and wait it out until we thought that Sophia was ready to really be potty trained.The tough part was while we were trying to get her potty trained at home, daycare wasn’t following suit. I mean, yeah, they would put her on the potty from time to time, but it wasn’t a routine. It made it difficult for us to get her into a habit at home. After a while, she was great at going pee on the potty. 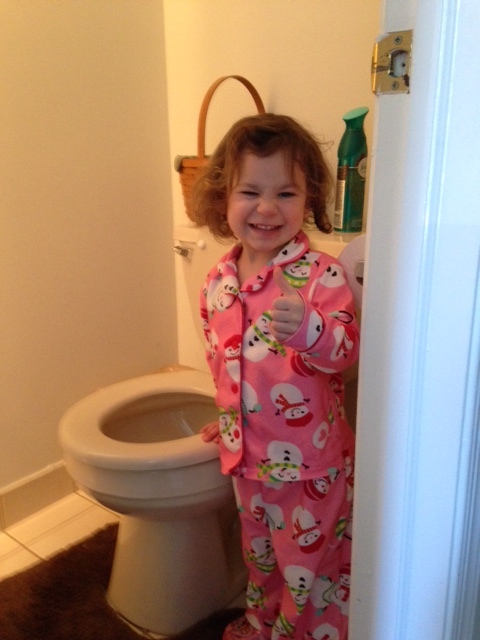 She’d tell us that she had to go–either while wearing underwear or a pull-up–and up on the potty she would go. It got to a point where she was getting really great at peeing on the toilet while we were at home. We started letting her wear underwear again. And then, one weekend where it was just me and her at home, she walked into the kitchen in her underwear, and when she came back into living room, she had what I can only describe as a tail made of poop protruding out the back of her underwear. To the outside observer (and myself, even though I had to clean her up) it would be a hilarious site. This huge chunk of poop just hanging out while she walked around. The scene of the great doggy poop-eating crime. We’d try and try and try to get her to poop on the toilet. But, for whatever reason, she was scared to do it. This could also be due to an incident that happened the first time she ever pooped on her little training potty. No sooner did she poop and get up excited, did our dog, Dubsy, stick his face right in her potty and eat it. Yes, our dog ate our daughter’s poop. From then on, every time we’d try to get her to go number two, she’d say “I don’t want Dubsy to eat my poop”. Well, that put a damper on whole potty training thing. Our goal had always been to have her potty trained and out of pull-ups by the time we had Maddie. We didn’t want to have to buy diapers/pull-ups for two kids at the same time. They’re expensive! So, that didn’t happen. But, we have finally found success in the new year! Yeah, we’ve had our share of accidents in the month or so since we’ve started. But, we’ve been consistent with getting her on the potty every hour or so and the teachers at daycare have been doing the same thing. The only time she wears pull-ups right now is when she goes to bed. She hasn’t yet mastered the art of holding it all night long, but it’s just a matter of time before she does that. I’ve heard many a horror story about other parents experiences potty training their kids. They’d have all sorts of messes and accidents. Poop and pee everywhere, at all hours of the day. If you want to read a real horror story about potty training, go check out Tommy Riles’ post at Life of Dad. I’m extremely grateful that we have had it relatively easy, save for it taking longer than we would have hoped. Now, every time she goes on the potty, I sing “Potty time, excellent” with the Wayne’s World theme music playing in my head. What were your experiences like with potty training? Good, bad, messy, REALLY messy? Let me know in the comments, on Facebook, or @brownie_22 on Twitter!